Ben Gamari had implemented an ingenious version of the Riffle hardware that measured the conductivity of water (aside: for a great tutorial on conductivity in a water quality context, pointed out to me by Jeff Walker, check out this Fondriest guide) by exploiting the properties of an old chestnut of an integrated circuit: the '555 timer'. I'm looking to breadboard a similar circuit myself, in order to understand the basics of how this setup works. Figure A: 'Astable' wiring diagram for a 555 timer. where: - f is in Hertz (cycles per second) - R_A and R_B are in Ohms - C is in Farads. Fig B: The typical pinout on a 555 IC. Plugging these values into the above equation for the frequency, 'f', we get f = 1.2 seconds -- which is about the frequency I observed when I connected an LED on the 'output' pin. The motivation for this exercise is the following: due to the straightforward relationship between the resistor and capacitor values in this 555 circuit and the oscillation frequency of the 555 output, we can use this circuit to measure the resistivity (and, thus, the conductivity) of water. The idea is: set up the above circuit with known values of R_A and C, but connect wires ('probes') from the circuit through a water sample so that the water is the 'resistor' R_B. By measuring the frequency of oscillation of the 555 output, we can back out what the effective resistance, R_B, must be between the probes. This is really cool. I would never want to discourage someone from using a 555. And it would be totally sweet to use audio gear to record and imagine changes in resistance using the 555 as an oscillator. BUT-- I don't think you need the 555 unless its frequency generator functions as a sort of amplifier for a weak signal. I doubt that this is useful though. I think you can do it directly through your system's ADC. 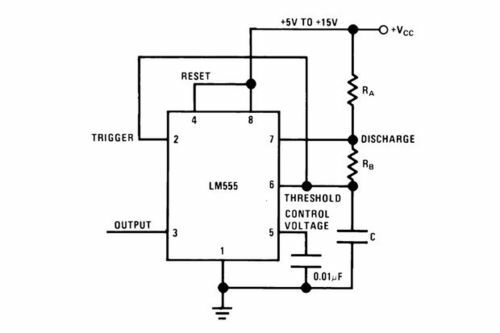 The 555 uses a voltage divider to set the frequency based on the divider's ability to step down voltage. An ADC can already measure voltage, here's arduino code for getting back to a voltage from a raw data input. With that, you can use the voltage divider equations in the wikipedia page to solve for the unknown resistance of the water. 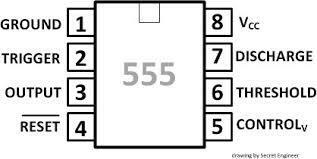 the 555 is pretty simple. There's not that much inside of it. If it simplifies the power circuitry issues you're facing then go with it. I hadn't thought about the oscillations being important either, but I don't see how that solves the polarization issue-- the signal coming out will oscillate, but you're taking DC in. I guess I'm wondering why the electrodes have to be 2cm apart, also remember that you're not measuring impedance of the water, you're measuring it in series. By playing with the other side of the voltage divider you could probably adjust for this issue. I'd go for the capacitor method. I think the power consistency issues you're facing will be almost identical with the 555. Egads! Mat, thanks for pointing this out! I totally flubbed that one: in the 555 approach, the signal that is passing through the water is indeed DC, as you say; it's the oscillatory signal coming out of the 555 (and not going through the water) that we're measuring. I think in my head I was conflating several discussions with Ben around more than one method, as well as some discussions l'd had with Julian Tyson about potentiostats (also only vaguely understood). the power issues are going to be tough. Most power control chips do tricky high-speed things to push out a DC signal and the voltage isn't very clean. A dedicated battery for the sensor will give a nicer DC signal. my suggestion is to research audio equipment. Somewhere there is an audiophile electronics nerd with a portable headphone amp design that will give you the clean, consistent AC power signal that you're looking for. I'm also going to re-iterate my earlier suggestion of using a 1/8" mini-jack for conductivity, it'll give you 2mm spacing. TOTALLY SPACED on the awesome 1/8" mini-jack idea!! I need to order some right now. Wow, i'm not sure I follow all of this, but is one potential advantage of the 555 that we could even skip the arduino entirely, if, say, we wanted the output to be solely a blinking light or a beep, which could be read over the audio channel into a smartphone or laptop? Yes, exactly! I would love to see an analog "retro edition" riffle with a microcassette recorder and a 555, maybe in a really nice Ball jar. ZOMG that's brilliant. I'm going to try to bring the materials required to do a rough prototype of this to Plymouth -- but anyway shouldn't be hard to try out one way or the other! Also: how hard would it be to rig up some sort of 'pen' that connects to a 555 and writes out a 'record' of the conductivity on some physical medium? Writing onto a paper strip like a seismograph is cool -- but maybe difficult? Is there some other way to translate a changing voltage into something that creates a 'written record'; -- even if it only lasts for a few days? Sand patterns on surface vibrated at these frequencies? Some other material vibrated that would show a 'history' -- like corn starch and water? WARNING: do not, under ANY CIRCUMSTANCES get distracted by searching e-bay for vintage Hygrothermographs.